These Teton fishing carving sets feature a distressed wood look with old-time crack painted fish lure theme. 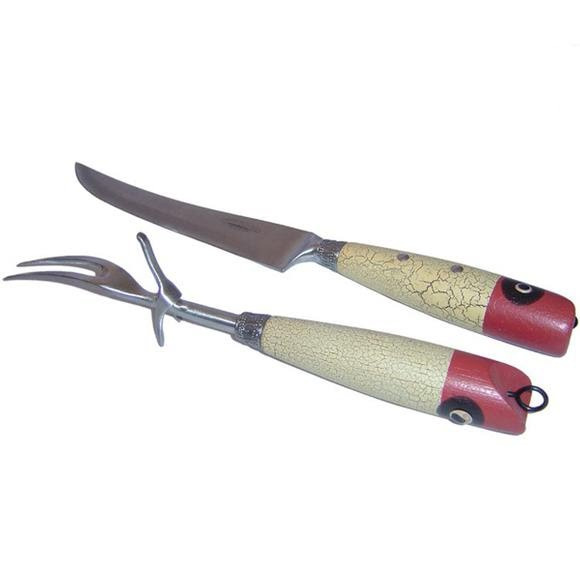 These carving sets come in pairs of surgical grade 420 stainless steel carving knife and a muscular meat fork that holds meat in place and makes cutting easy with a classic hilt rest. An embossed steel handle collar recalls the elegant style of a bygone era. These Teton fishing carving sets feature a distressed wood look with old-time crack painted fish lure theme. These carving sets come in pairs of surgical grade 420 stainless steel carving knife and a muscular meat fork that holds meat in place and makes cutting easy with a classic hilt rest. An embossed steel handle collar recalls the elegant style of a bygone era. Make meat carving precise and quick with these premium sets. Surgical grade 420 stainless steel carving knife, honed for effortless slicing. Muscular meat fork with classic hilt rest. Embossed steel handle collars recall the elegant style of a bygone era. Themed handle detailing (solid, distressed wood).